“Beer and a burger” is such a vague phrase. The same goes for “pie and a pint”. What kind of burger or pie, and, more importantly, what type of beer? Why just burger or pie? Is it the appeal of the alliteration? In which case, why do pubs not also offer sausage and stout? Or popularise anchovies and ale? 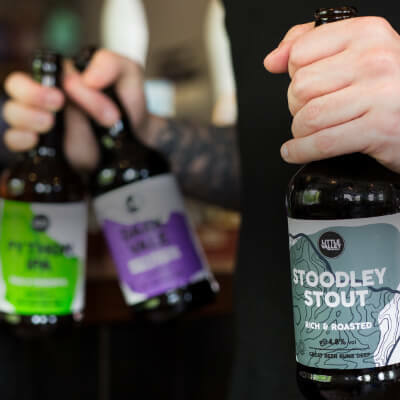 The point of all these questions is to highlight the fact there’s a superabundance of favourite pub foods – and there’s a Little Valley beer that complements them all! There are few better places, or quintessentially British, to enjoy beer and food than a pub. Nowadays you’ll find twists on classic pub grub that creates food of the highest order. The sausage, for example, is no more just a humble cylinder of swine, with bangers now rammed to the rafters with herbs and spices that offer a huge range of complex flavours. What better to have with it than our Cragg Vale Bitter. Bitterness from the hops will cut through the meat and the bitterness is balanced by a sweetness from the malt that will complement the natural sweetness in sausages and bring out the best in them. We can’t talk about classic pub grub without a nod to fish and chips. It really is a dish for all occasions so the beer should be something of an all-rounder, and Withen’s Pale Ale fits the bill. The beer is a balance of malt and hops but leaning more towards the latter. It has citrus notes that perfectly complement the fish and there’s good carbonation that cut through the fatty batter and cleanse the palate after each bite. You’ll find chicken curry happily ensconced on most pub menus and our Hebden’s Wheat will partner it perfectly. It lends itself particularly well to spicy versions, with the sweetness from the beer tempering the heat and letting the more subdued flavours of the dish come to the fore. Macaroni cheese is a comfort food classic and each pub has their own take. 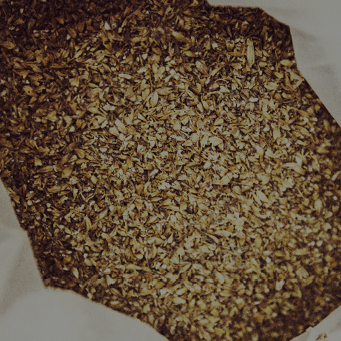 Python IPA, our earthy, fruity India Pale Ale, will spike some of the sweeter notes in the cheese and the beers carbonation will then slice through the dense texture like a cheese knife and scrub the palate in between mouthfuls. Heartier fare such as shepherd’s pie or steak and chips, both firm pub staples, are very well accompanied by our Moor Ale, a smoky, rich and full-bodied beer. A great example of a beer matching the flavour intensity of the food. Most pubs offer roasts on a Sunday and a good measure of their roast-making capabilities is the quality of the crackling on their pork. 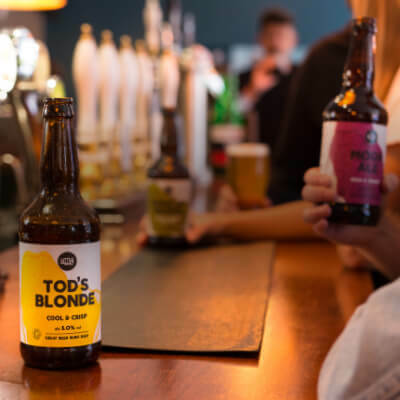 But whether its brilliantly brittle or disappointingly chewy you can rely on our Tod’s Blonde to make the most of it. A clean, crisp beer with some subtle citrus notes it’s a great match for the somewhat gentle flavour of pork. What’s lunch or dinner in the pub without dessert? You could opt for apple crumble or a chocolate dessert with a glass of our Vanilla Porter – a match made in pudding heaven. And here’s a top tip to finish: try our Stoodley Stout with a generous chunk of Stilton. The sweet notes of the beer will contrast the saltiness of the cheese and enhance its creaminess. It’s a combo sure to win-over even the most hardened Stilton sceptics.